SnarkyDork: Happy Belated To Me! It's really fun to come home from work and find that a belated birthday present has arrived in the mail! 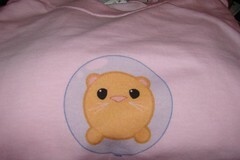 A couple of my buddies from Swazzle sent me a t-shirt with Tinker, the hamster-in-a-ball puppet character that was modeled after my own adorable hammy Ami. Now I don't feel so bad that I'm so late giving Ren hers. It's not as late. Yet. pffft. i STILL have not finished yours. STILL. but i will...this weekend. i swear. Gotta love belated b'day presents...another reason to celebrate. When was it your birthday? Oh, my birthday was a while back...October 1st. It was low key one. You mean you celebrated in a house with a small door?